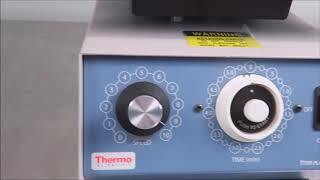 The Thermo Scientific 4625 comes from a long line of Lab Line 4625 shakers. Thermo Scientific purchased the company and kept the reliable model as staple with some cosmetic updating and optional digital features. The controls on this lab shaker are simple and intuitive. Simply set your speed on the microtiter Shaker from 40 rpm to 1100 rpm and then set it to either continuous or timed shaking. The Thermo 4625 Shaker can be set for timed shaking up to 5 minutes. This can be easily selected by a rocker on the 4625 control panel, which can switch between constant and timed. In addition, the 4625 has a nonskid top and retaining springs to hold the plates. The 4625 also has rubber feet which stop the Thermo 4625 shaker from moving during operation. Dimensions 10" x 11" x 4"
This Thermo Scientific 4625 Micro-titer shaker comes fully tested and backed with our standard warranty. Please give us a call with questions about any of our used laboratory equipment listings.